Wait! Before you read this, you have read the AMAZING article on Vulture.com regarding the rise of the new Valiant haven't you? It's a short, concise and brilliant tale of how one fan bought the rights to one of modern comics' most acclaimed universes. One of it's points relates the companies approach to Bloodshot. Highlighting how the nanite infested killing machine isn't a parody or a radical reimagining of an action-hero: but rather just gets on with being a story about an action-hero. In April, fresh from hit mini-series The Valiant, Bloodshot steps into one of my most anticipated reads of 2015, Bloodshot Reborn. Written by new Marvel's latest Hawkeye scribe Jeff Lemire, and packing the artwork of Mico Suayan's career, the ongoing series will debut with all guns blazing. But why reboot a character that only debuted debuted in his own series at the dawn of the new Valiant age, a few short years ago? From my perspective it is easy. The last Bloodshot series was the first new Valiant title I picked up and the first one I jumped off. It's not that the stories were bad, the new Valiant could publish a book of it's staff names and it would still read better than many of those from the Big Two - such is the 'new' Valiant tradition - it just didn't seem like the series was Bloodshot-ish enough or willing to cut as deep into character as it's star was willing to do to his foes. 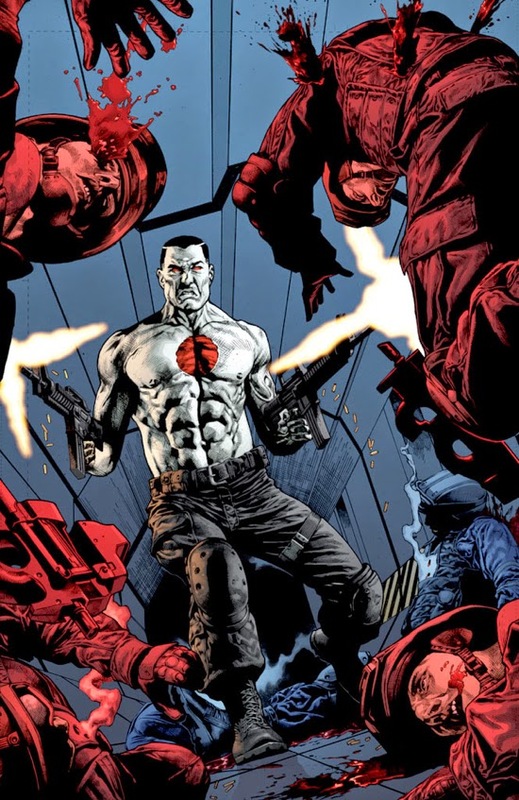 While events like Harbinger Wars put all the dots in their right places, having Bloodshot join the Suicide Squad-ish H.A.R.D. Corps weakened the plot, as in my mind Blood' works best alone. On T.H.R., Jeff reveals the focus for him will be in turning the "creepy", almost soulless gunman into something more relatable. A Frankenstein-ish tale, if Frankenstein carried a mini-gun and a range of combat knives. Free from following the orders of others, the man without a past and only snapshots of his former life will find himself crippled by his new found freedom, not knowing what to do first and guilt over what he has done before. A drift in society, the identity he finds forming around him will make Bloodshot one of THE reads of 2015, and it all starts this April. You have been warned. That artwork alone is phenominal Dan. I guess if they felt he needed one, than so be it. Lemire though is a very solid writer, so I hope his take on 'Shot will do as well as expected. I don;t why it shouldn't. Looks like Valant is continiing it's usual standard of excellence in 201 already.